Genetic testing will reveal your relationships to other families, other populations from Russia, and other ethnic groups. The Mari (Cheremis) are a native Finno-Ugric people of European Russia who are predominantly of Western Eurasian descent. The Mari El Republic is part of the modern-day Russian Federation and borders Chuvashia, Tatarstan, and two oblasts. Some Mari people live in Tatarstan and in northern Bashkortostan. Those in Bashkortostan call themselves the Eastern Mari. The other groups are called Meadow Mari and Mountain Mari. The Mari language is classified as Uralic and written in the Cyrillic script. Most Mari people are either believers in Christianity or the polytheistic Mari traditional religion though some Christian Maris also believe in elements of the Mari religion. About 49.5 percent of Mari males belong to the Y-DNA haplogroup N1c, which is commonplace among Finnic and Uralic speakers of northeastern and eastern Europe including the Mordvins, Udmurts, and Komi. The Maris' second most common Y-DNA haplogroup is R1a, which is also common in other eastern European ethnic groups. Two Mari males tested through Family Tree DNA up to 2003 belong to the Y-DNA haplogroup R1a. 5% of Mari males belong to I1, 2% to R1b, 2% to G, 2% to T, 1% to I2*/I2a, and 1% to I2b. Racially, Maris are overwhelmingly descended from Caucasoids, with only a small amount of Mongoloid admixture. Boris Abramovich Malyarchuk, Miroslava V. Derenko, Tomasz Grzybowski, A. Lunkina, Jakub Czarny, S. Rychkov, I. Morozova, Galina A. Denisova, and Danuta Miścicka-Śliwka. "Differentiation of mitochondrial DNA and Y chromosomes in Russian populations." Human Biology 76:6 (December 2004): pages 877-900. "In Europe the highest frequencies of paragroup N* (up to 42.5%) were detected in Volga Finno-Ugric populations: Udmurts and Mari (Rosser et al. 2000; Khusnutdinova et al. 2002)." 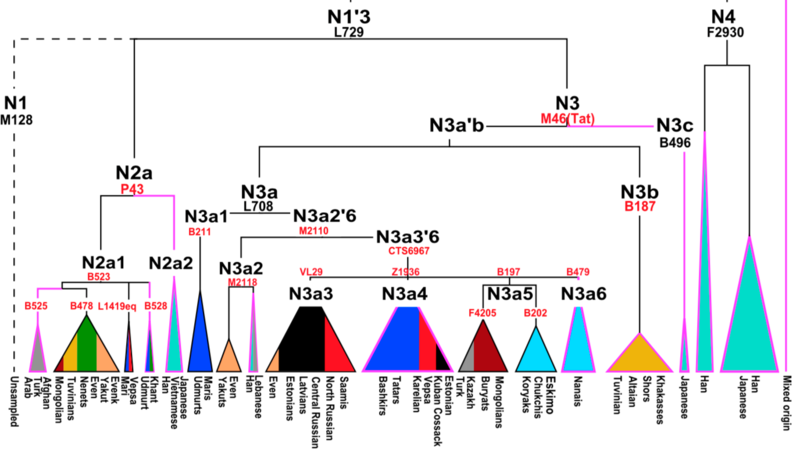 Mari people who carry Y-DNA haplogroups within the N family mostly belong to haplogroup N3a1 but a small proportion of others belong to N2a1's branch L1419eq. M. A. Bermisheva, Kristiina Tambets, Richard Villems, and Elza K. Khusnutdinova. "[Diversity of mitochondrial DNA haplogroups in ethnic populations of the Volga-Ural region.]" Published in the Russian language. Molekuliarnaya biologiya 36:6 (November-December 2002): pages 990-1001. 136 Mari people had their mtDNA sampled for this study. 40.4% of these Mari belong to the mtDNA haplogroup H. Next most common is U5, found in 14% of the sample. The others, in descending order of frequency, were HV0 (11%), U4 (10.3%), J (7.4%), T* (3.7%), Z (2.9%), K (2.2%), HV* (1.5%), T1 (1.5%), D (1.5%), A (1.5%), I (0.7%), M* (0.7%), and C (0.7%). Haplogroups A and M are of East Eurasian origin. Boris Abramovich Malyarchuk, Miroslava Derenko, Galina Denisova, and Olga Kravtsova. "Mitogenomic Diversity in Tatars from the Volga-Ural Region of Russia." Molecular Biology and Evolution 27:10 (2010): pages 2220-2226. After adding additional Volga Tatar samples that they themselves gathered, these scientists reiterate what Bermisheva's team reported in their 2002 study in Molekuliarnaya biologiya that Mari people have fewer mtDNA lineages from eastern Asian sources than do the Udmurts, Komi-Permyaks, Bashkirs, and Volga Tatars. Table 2 repeats the mtDNA frequencies of the 136 participating Maris, among others. V. L. Akhmetova, R. I. Khusainova, E. B. Yuryev, I. A. Tuktarova, N. V. Petrova, S. V. Makarov, O. I. Kravchuk, G. V. Pai, E. V. Balanovskaya, E. K. Ginter, and Elza K. Khusnutdinova. "Analysis of polymorphism at nine nuclear genome DNA loci in Maris." Russian Journal of Genetics 42:2 (February 2006): pages 192-207. Translated from the Russian edition that appears in Genetika 42:2 (2006) on pages 256-273. This study is devoted to examining the genetics of the Maris living in six districts of the Mari El Republic. Both Meadow Maris and Mountain Maris were tested "at nine polymorphic DNA loci of nuclear genome." Genetic diversity among Mari El's Maris was found to be between different Meadow Mari populations moreso than between Meadow Maris and their Mountain Mari brethren. N. V. Trofimova, S. S. Litvinov, R. I. Khusainova, V. L. Akhmetova, I. M. Khidiyatova, Richard Villems, and Elza K. Khusnutdinova. "Analysis of the Y-chromosome in the Volga-Ural region populations from Russia." A presentation given at the European Society of Human Genetics (ESHG) Conference 2015 between June 6-9, 2015. This research included Mari samples. "[...] Maris stand out from other geographic neighbors due to unusually high recent admixture with Bashkirs: they demonstrate higher IBD [identical-by-descent] sharing with Bashkirs for all IBD tract length classes (from 1�2 cM up to 11�12 cM) compared to other populations in the region (p < 0.05). This might be explained by the fact that we collected Maris samples in the Republic of Bashkortostan, where they seemingly intermarried with Bashkirs to some extent. [...]"